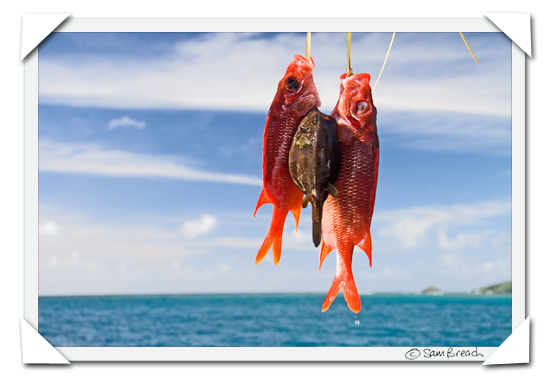 One of the things I wanted to do more than anything when I was recently in Fiji was catch my own fish (again). What better than the chance to go hunting with a local guide? We hijacked a snorkelling trip one afternoon. No fancy equipment was involved - all I had was one long, rusty, metal rod with a slightly whittled down and rather blunt point on one end and a tiny fork at the other. The spear was accompanied by a small rubber sling. The idea was to hook the fork-end of the spear into the sling and then pull the spear back until the rubber band was taut. Once under water, when the pointed end of the spear was aligned with a cute and colourful little reef fish, you would then release the spear from its enforced position of tension and kah-ching! Off your spear would speed, gliding fast through the water, completely missing Nemo and coming to a rest on a bed of coral instead. Before you think that doesn't sound too tricky, and that surely, you would never have missed a target, let me remind you that at the same time you are snorkelling in a location where your feet do not touch the bottom. Not even close. So, where ever your spear lands you have to free dive down to retrieve it. When you are borrowing a spear that belongs to the locals, and when that spear is all rusty, old and seems to you like it must be some kind of heirloom, fear of losing said spear becomes far greater concern than your desire to catch a fish. On my third, failed attempt I flung my spear at a poor unsuspecting Angel fish who quickly darted off to avoid my missile. The spear landed precariously at the edge of a reef and very slowly started to fall. This set me in a panic. Below it lay the deep ocean floor, which I knew I couldn't even hope to reach. I took a deep breath and dove down to retrieve the rod. Due to the fact that my mask acted as a magnifier, the spear was apparently further than I imagined and I failed to quite grab it on the first attempt. I bobbed up to the surface, wheezing and spluttering, adrenalin pumping and heart beating fast. I looked around for someone to perhaps help me but Fred was nowhere to be seen. I had to gain my composure, give myself a serious talking to and conjure up enough bravado to try once again. It was tough, but on the next dive I managed, albeit barely, to regain control of my spear. I gave up that point. Fear was greater than desire. Thank goodness Seruvi was able to show us how to do it properly! I went deep sea trawling too. 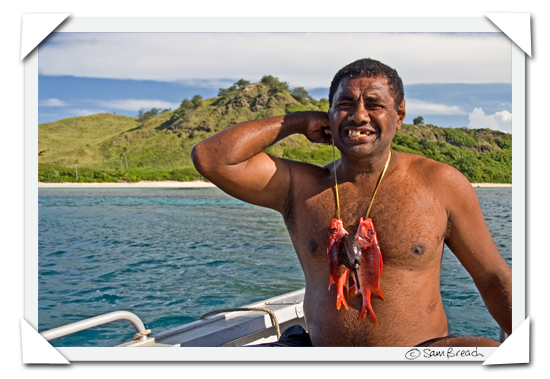 I wanted to catch a big fish and take it back to Navutu Stars so that all of the guests could share it for supper. ?Have you ever caught a fish with a spear? All the time. I regularly catch sashimi with two little wooden spears. Slippery little buggers, though. Every so often one of them gets away and falls into the soy sauce. What better reason for returning than that? I think you missed on purpose~ just to go back! I've never caught a fish, period. I'm a fan of fish that have been pre-caught for my convenience. The diving sounds amazing, tho. Brett, that totally deserves best comment of the year! 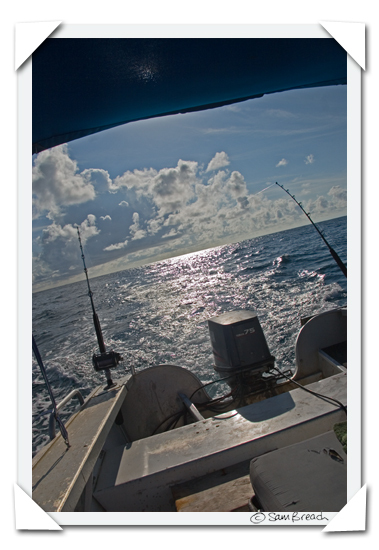 Sam, it's also possible to go deep sea fishing for marlin and yellowtail much closer to home. C and I have plans to head to Mexico (on the Sea of Cortes side) sometime this spring. Last time I was there, I caught a 17-lb yellowtail! Cute necklace. I love the colors. Did he sell it on Etsy? Easiest fishing in the Bay Area - Hagemanns Trout Farm (spelling?) on road between Petaluma and Jenner - about 2/2 way toward Jenner. Sort of more like picking them out of a tank rally but a great place to take kids (old and young) to guarantee some success the first time out. Best fishing I ever did - lake perch and pike in Loch Corrib in Co. Galway Ireland - had to work too because all we had was a rowboat - but I like rowing. Spear fishing - have to admit I personally have never succeeded in this method although I have tried. All I can say was that the 8 pound bass someone else caught was really tasty! A spear and a fish??? Does this have to be a live fish? Does a fork count as a spear? I've gone bone-fishing in the past with a fly rod on salt flats down in Florida (I was terrible). This looks amazing, if equally difficult. I spearfish almost everyday. Nothing's better for the mind, body and soul. And... Free Fish! The kelp beds we have down here are really remarkable and there's always oppotunities to bag kelp bass, yellowtail, white sea bass and the like. All very good eating!